A cultural center that opened last week in a Southwest Alaska village showcases thousands of Yup'ik treasures rescued from a nearly 500-year-old site along the eroding Bering Sea coast, organizers said. 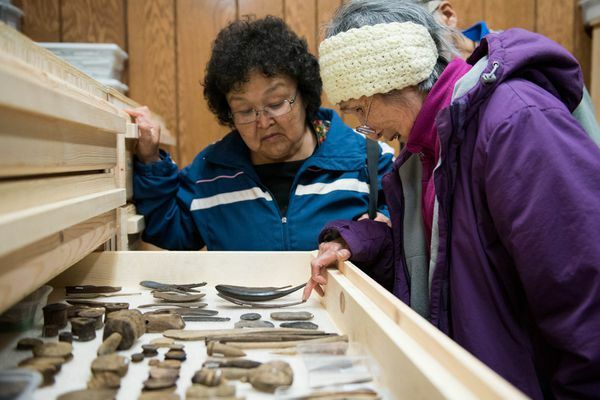 The trove at the Nunalleq Culture and Archaeology Center in Quinhagak some 450 miles west of Anchorage features high-tech tools and ornaments of the past, underscoring the region's rich heritage. The collection includes ivory inflators once used to blow up seal-stomach floats. The floats attached to harpoons to serve as buoys for capturing marine mammals, so the animals couldn't swim away. There are drill bits made from jade transported several hundred miles from the Kobuk River region. Wooden gaming darts with bone points helped young hunters sharpen their aim. A beautifully carved ivory toggle features the face of an owl and back flippers of a seal. Those and other objects are remarkably preserved, as if the village's Yup'ik ancestors wanted to share them with future generations, said Warren Jones, chief executive of the local Native corporation. "It's like they were waiting for us to find them," said Jones, who led the effort that launched the dig eight years ago. A favorite object of his is a "mind-boggling" chain made from walrus ivory, featuring two links and similar in appearance to a metal chain today. "It amazes me that without any power tools or sandpaper how gorgeous it looks," Jones said. 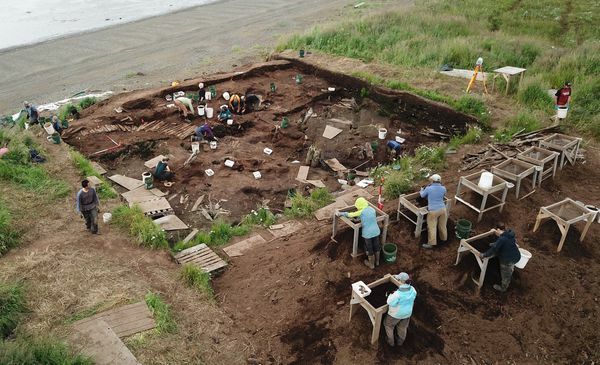 Rick Knecht, lead archaeologist at the site called Nunalleq, or "old village," said the excavation is unusual in part because the Yup'ik often want to leave ancient sites undisturbed, out of respect for their elders. The site features communal sod houses thought to have existed from about the mid-1500s to 1670, when the last house was burned in an attack. This century, accelerating coastal erosion in the age of climate change had begun to expose the site. 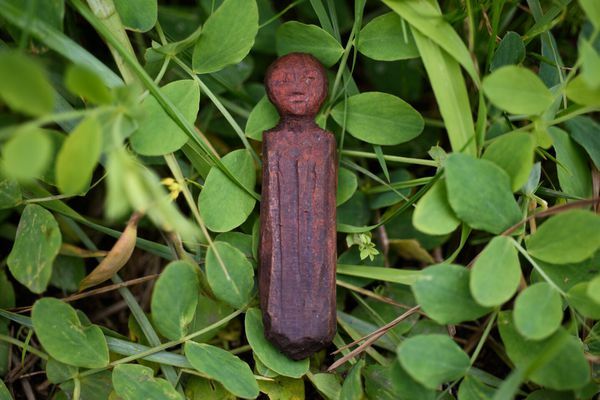 Artifacts were threatened as once-protective permafrost thawed, prompting the village to launch efforts to save them. Well over 60,000 objects have been recovered and preserved, including rare masks and figurines, fishing lures, spears, bowls and knives. Thousands are "exhibit quality pieces" that can be viewed at the center, Knecht said. The value of the dig is evident from Knecht's Facebook page, where photos catalog daily discoveries. Crews have found woven-grass rings and rope for hanging oil lamps. Tiny carvings depicting animals that adorned hunters' visors. Tally sticks to keep score in games. The materials are considered the oldest and best-preserved Yup'ik artifacts ever recovered. "Each seal hunter was a floating work of art," said Knecht. "Everything was made to be as aesthetically pleasing as possible to show respect to the social world, the animal world and the environment in general." Jones said the center will be open daily through the fall, but will close seasonally this winter. It's already drawing tourists, including scholars and large groups of sportfishermen. Jones said the dig, funded with support from the corporation and the University of Aberdeen in Scotland where Knecht works, has created badly needed jobs in the village of 730. Cultural pride is another benefit too. "A lot of people were very emotional" at the opening, Jones said. "It was a very good experience, with happy tears."